11214 Brighton Knoll Loop, Riverview, Fla. This fantastic 4-bedroom, 2.5-bathroom, 2-story new construction home on a large retention pond in the middle of Riverview has all the amenities and upgrades you could ask for from a new home builder. Come check out the pictures below and contact Nassoma Lewis for more details. The large master bedroom on the second level of this home has enough room for two kind-sized beds, and a walk-in closet larger than most rooms. Plus, the upgrades in the bathroom are splendid. This brand new kitchen has the best stainless steel appliances with plenty of cabinet space and a tremendously large center island. Plus, the sink sits under a window overlooking the lake in the backyard. This great big living room runs over from the kitchen and connects every area of the main level. 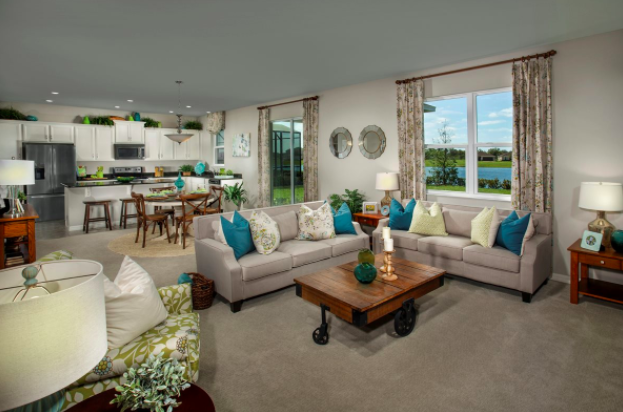 You'll have plenty of room to set up your couches, TV station, as well as a table and chairs too. I Want to See More Homes Like This! Fill out the form below to talk directly with the buyer's agent on this property, Nassoma Lewis. Have you been pre-qualified for financing? I Want to See More Homes Now! Thank you for reaching out to Nassoma about his home on Brighton Knoll Loop. She will get back with you soon. Hohman Homes is a residential real estate brokerage and new home consultant headquartered in Tampa, Fla. Our vision and mission driven Team service the needs of homebuyers and sellers throughout the greater Tampa Bay area and beyond.